Luke Cooper loves convenient and efficient solutions. That’s why he founded Fixt, an on-demand mobile device repair service. If you have a problem with your phone or tablet, a technician will come to your home or office, fix the problem, and return your device as good as new in under two hours. (They even replace cracked screens — raise your hand if you could use this service right now!) The Baltimore-based startup launched in 2015 with the goal “to support every employee at every enterprise company in the United States.” So far so good. 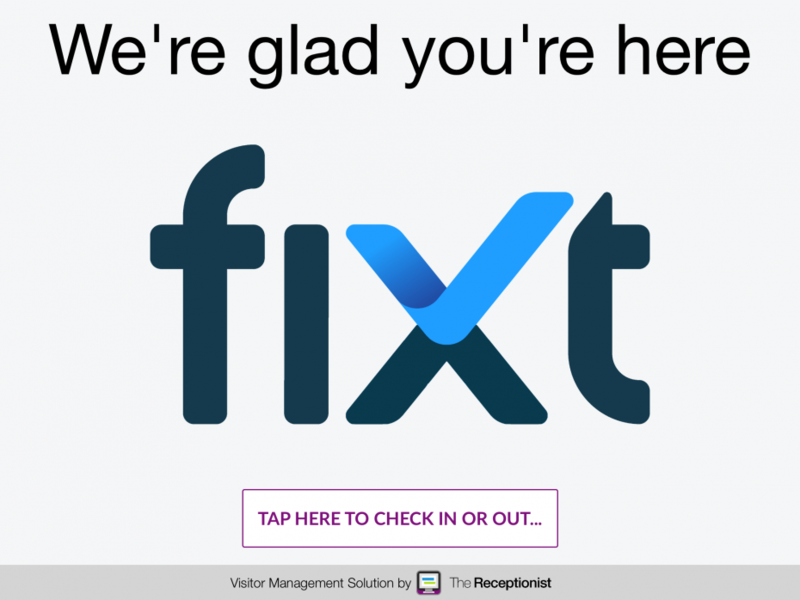 Fixt currently serves T. Rowe Price, Stanford University, and Coca-Cola, among many others. And the company is growing quickly. To keep their office running smoothly, Cooper needed a way to reduce interruptions from people just walking in. “Previously, we were in a shared office environment without a receptionist,” he explained. “Because we were closest to the door, people would see us and just walk up and start asking questions, which can be very disruptive to flow.” He wanted a solution that was “asynchronous, autonomous, and allows you to be hands-free.” The Receptionist for iPad fit the bill. Cooper had seen the visitor management system at another company in Silicon Valley. “I thought it was really cool,” he said. So, he decided to give it a try when Fixt moved out of their coworking space and into their own office. “The Receptionist for iPad has done exactly what I wanted it to do,” said Cooper. He also said that the overall reaction from visitors has been positive. They think it’s a smart solution to a very common problem. From one tech company to another, we’re thrilled to be included in the office technology stack of innovative businesses like Fixt. To learn more about how The Receptionist for iPad can benefit your business, start your free trial today. About Fixt Fixt is an on-demand mobile device repair service that makes repairs easier, cheaper, and more reliable. All you have to do is open the app and press the help button and one of our certified technicians will be en route to your home or office. With technicians all over the world, Fixt averages under 20 minutes to get a device back to new. They take care of your devices so you can focus on running your business.